HWI provides tours of several historic sites in Waxahachie. These tours give community members and visitors an opportunity to learn about Waxahachie history. HWI members are encouraged to volunteer to be a part of these tours as docents. If you are interested in volunteering, please contact us at historicwaxahachieinc@gmail.com. 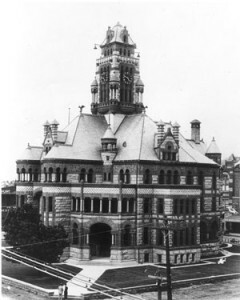 The Ellis County Courthouse is rated by the Texas Society of Architects as the eighth most significant architectural achievement in the State. This magnificent structure was built in 1895. HWI provides tours of the Ellis County Courthouse in downtown Waxahachie during the weekend of the annual Gingerbread Trail, which is held the first weekend in June. Tours are also provided for other special events and for large groups on an ad-hoc and prescheduled basis. Historic Waxahachie Inc. helped bring the Caboose to Waxahachie in 2011. Restoration included the outside being painted, the chairs & bed being redone, and now we can proudly say that the inside is finished! 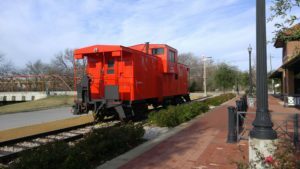 HWI provides tours of the Red Caboose in downtown Waxahachie near the MKT Depot during special events downtown and on an ad hoc prescheduled basis. HWI offers tours of the Wyatt Office and the Calaboose so the public can see the progress of our ongoing restoration efforts of these buildings. They are located across from 216 N. College Street in the Singleton Plaza near downtown Waxahachie. The Wyatt Office may be the oldest commercial building still standing in Waxahachie. It was originally at the southeast corner of West Main Street and Jackson Street, and then was moved to the center of that block when a new modern filling station was constructed. HWI saved the building from demolition and moved it twice before it settled in its current location. 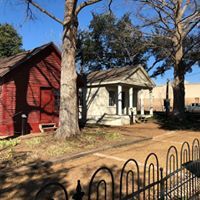 The Calaboose was built as a local lockup for minor crimes under the jurisdiction of the City of Waxahachie. This Calaboose is at least the third one built in Waxahachie. It was built for $850.00 in 1888. The interior still reflects the very unusual and strong construction and the fire damage from an apparent attempt to escape. By 1904 the building was vacant and later it was used as a warehouse. It was originally on North Jackson Street.